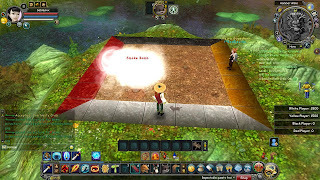 I thought I'd write about some of the free to play stuff I've been dabbling around in. When I look for a free game, I always look for ones that offer a lot of stuff to do, sometimes those that have pet systems, but mainly those that are easy to jump in and get to playing. I found a few hidden gems, just sitting there waiting to be discovered, hadn't heard of these until pretty recently. Need something enjoyable and laid back to play around with casually? Something to tide you over while you're waiting on GW2 or one of the 'near' future releases? These are good ones to tide you over. I play a lot of PWI games and this is one of the newest. If you've played Battle of The Immortals then you'll probably notice a lot of similarities. It is pretty much the same type of game, newer flashy graphics, same type of play. The game looks good, has a high xp rate (might make your head spin), and is really fun for a basic hack and slash MMO. It has the same pet system as BoI, basically you can tame whatever mob you want in the game, so many to choose from! I really like this pet system. There is a PvP system too, if that's your thing. I'm not high enough to have had a chance to try it. 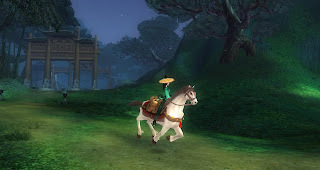 You'll get a free, and very nice looking, mount from questing. Also you're shown how to obtain a pet, given several items to tame more- in case you don't like that one. The game also gives you a free class oriented appearance item. I was pretty happy with all the things I started out with and the rate the game moved along. I did see a lot of people running around so it seems to be doing well. Pros- Fast fights, lovely visuals, can zoom into character and waaaay out. 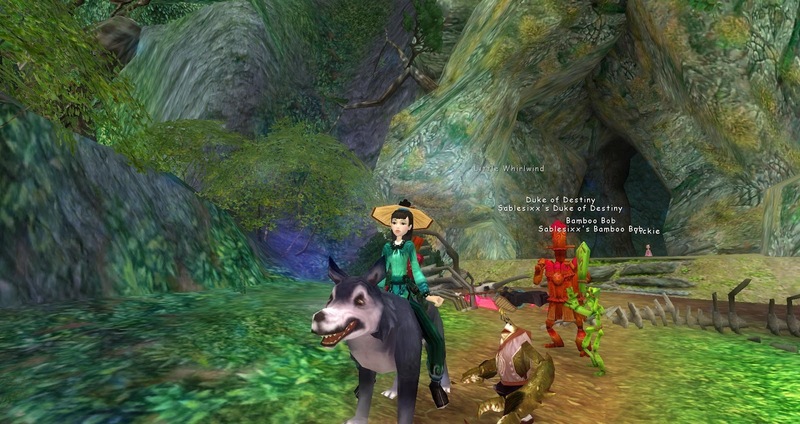 Auto-routing system, simple quests, huge variety of pets to tame. Fast leveling, interesting looking zones. Cons- The game is just like BoI, which might not be a con, but it is almost exactly like an updated version. Repetitive combat, no PvE server (though only certain maps are said to be PvP later in levels), huge dependency on potions. The world is pretty, despite the older look and feel of the game, it has a nice oriental / fantasy feel to it. Questing is interesting, nothing outstanding but it does give you a feel for the game and leads you through things instead of just throwing you into the fray without having any idea of what is what. You choose your class after a few levels, it gives you the option to think and check them out. It has a nice selection of classes and you get a class pet, class weapon and appearance clothing when you choose one. At level 40 you also get a pet specific mount. They are very lovely and interesting looking too. I have read that the game has great holiday events, it also has events through the day, so there is a lot to do. I saw a few people here and there, not as many as other games but I did see people questing and a few higher levels running around too. I do hear it has a nice community as it isn't large. One thing that drew me to try this is it is under the same publisher as Zentia, so I had to try it to see if it was good. If you go in expecting a cute hack and slash with some charming yet older type graphics you won't be disappointed. If you're looking for flashy graphics with a newer UI, you might be ;) Leveling seemed a moderate speed and auto-routing can help you find what you need. All in all it seemed solid. Pros- Tons of pets to choose from, a pet area to tame them, class pets, class mounts. Appearance slots, cool looking armor, meditate ability to regen with. Auto-routing to help find your way, nice community, very cool pet system- such as second generation (stronger rares) and breeding system. Simple quick fights in combat. Cons- Pets can die easily at lower leves at least (summon again to bring them back out). Lots of walking all over for quests. Graphics may be a bit dated for some players, smaller community. Yeah, I'm going to talk about Zentia again. I love this game. IMO it has to be one of the best F2P games out there. If you want a game that offers a lot, this one really delivers. Tons of daily events, quests, instances, solo instances, collection quests, group quests and the like. 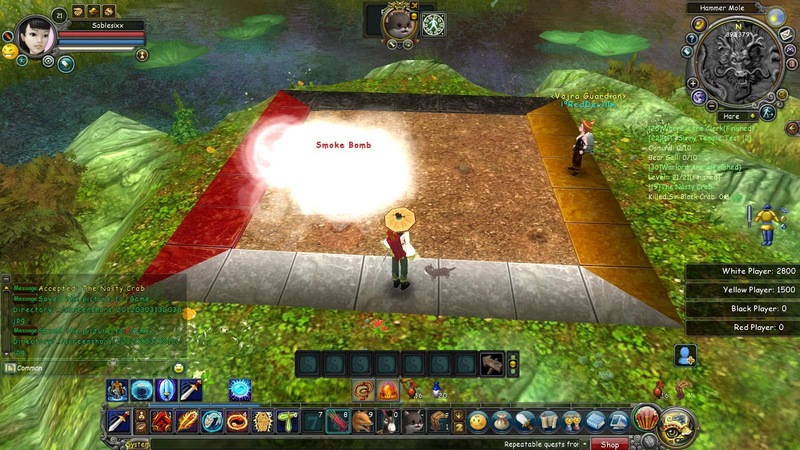 There are lots of fun things you can pick up along the way of questing such as access to a special leisure instances. Like what? Like; fishing, trapping wolves, treasure hunting, whack-a-mole, all rewarding a nice amount of experience while being fun and refreshing. There is a nice selection of classes to pick from too. Lots of content to keep you busy, this isn't a game where you don't have many objectives, there are almost too many quests, which is a great thing. You won't run out of things to do or choices. There is a lot of content in this game and fun things that still carry on after the level cap. It also carries through with a main quest line which leads you from area to area, gives you some sort of direction. Pet and mount system, I love it. 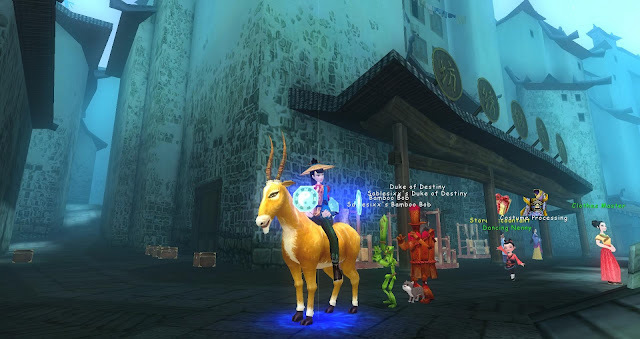 You can tame pets (which get cooler and faster as you get higher levels) and mounts in the game, you don't have to rely on the cash shop for it. You have to work on your taming skills to keep it up to par with your level though. I can't brag enough about Zentia. Really, I haven't felt the need to buy anything from it unless it was cosmetic stuff, which I haven't yet and that is just a want. For a free game it is absolutely fabulous. 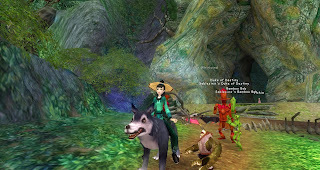 Pros- In-Depth pet and mount system with taming and training. You can sell/give pets and mounts to other players. Engaging combat, many instances to solo and group in. Daily events, leisure events, and holiday events. Decent xp rate but not too fast where your head spins. Guilds, guild halls, PvP specific arenas, PvP and PvE servers. Auto-Routing, huge amount of quests, quest list limit is large. Interesting tradeskills that don't have you running all over. Computer wise it runs well on many different specs. Cons- Cute cartoony graphics and armor, some players might be turned off by those alone. Playerbase isn't huge, rather small when you compare it to more popular games, some players may feel lonely at the low levels. Taming mounts can be time consuming to get them to spawn, or you might get lucky and find the one you want sitting there. Cash shop is rather expensive and many items have a duration on them. Taming skill requires you to work on it at a steady rate as you level and it can be dull, which you will want to keep this up as it is needed to tame different and better mounts or pets. So, check them out if you're looking for something free, casual and laid back! Doesn't cost anything and you just might have some fun. Click on the game names to take you to the official sites, if you're looking to check into them. Don't tempt me with more MMOs! I haven't been back to Loong since Gamigo got hacked a couple, of days after I registered. They told me I had to reset my password but for days their account systems were unavailable. Finally managed to get it changed last night so I hope to have another look around there soon. Zentia I still have to manually patch which is incredibly tedious and long-winded, with dozens of tiny files that have to be done in exact order, naturally, but which are not in that order where I downloaded them. Might get round to that although I am tempted to just re-download the entire game. As you know, my current vogue game is City of Steam, which I've logged into at least for a while every day since I got the Sneak Peak key. I've even read most of the website and the developers' notes there, which is something I hardly ever do. I'm aware I'm having an inappropriately strong reaction to what is no more than a pre-beta build with limited functionality, but it's just got that indefinable *something* that reminds me why I keep trying new MMOs. I really hope it makes it all the way to a proper launch and some form of commercial success and doesn't just vanish into indie limbo like so many others before it. Hehe! Yeah I haven't logged in since then either :( It wouldn't let me even after resetting info, figured I'd wait a week or so to try again. Oh yeah, I'd just download it again and re-install, don't remember it being a overly-huge DL. Easier on you too most likely! CoS looks like a lot of fun, so jealous that you got a sneak peek... Though I am the same... I need more games like I need another hold in the head. LoL! Can't wait to try it, you make it sound very enticing!